Summertime is in full swing, and for many women the search is on for a great sunscreen that can be applied under make-up. Whether you like applying sunscreen or not, it is critical for your health, and doing so will protect your body’s largest organ, your skin. There are also benefits of using sunscreen throughout the year because the sun, while not as harsh and noticeable in the winter, still produces harmful UV rays, so feel free to use the information here year round! There truly is a dizzying array of sunscreens and sun blockers out there. There are even cosmetics that have sunscreen in them. How is one meant to choose? First figure out which brands work best for your type of skin. If you’re trying a new sunscreen and have sensitive skin, do a little test on your inner arm and leave it on for 24 hours to see if there’s any reaction. Second, not all sunscreens will be suitable for use with make-up, so you might need a little trial-and-error here as well. 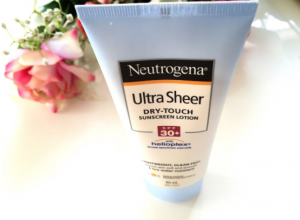 Lately I have been using a sunscreen that really works well with my skin and I want to share it with you: This is my Neutrogena Ultra Sheer Dry-Touch Sunscreen Review. I have been using the SPF 30 version and applying mainly on my face and neck area. You can buy this Ultra Sheer Dry-touch product from SPF 30 all the way to SPF 100. The Sun Protection Factor or SPF is utilized to measure a sunscreen products protection from UVB (Ultra Violet B) rays, the type that cause sunburn and contribute to skin cancer. SPF however does not measure how well a sunscreen will protect from UVA (Ultra Violet A) rays, which are also damaging and harmful. To find out more regarding what the difference is between the SPFs, I suggest reading this article: Higher SPF Myth. You don’t NEED more than SPF 30 assuming you apply the proper amounts and make certain to reapply every few hours, but why not increase your protection even by a small percentage if it is available. My family and I only use broad-spectrum sunscreens. When you’re out and about in the sunshine, you’re exposed to two forms of dangerous UV radiation: UVA and UVB. UVA rays penetrate deeply into the skin and are mainly responsible for the tanning effect your skin undergoes. It also contributes to skin ageing, wrinkles and causes some skin cancers. UVA is present at fairly consistent levels during daylight hours all year-round. UVB radiation, which is even more dangerous, causes skin reddening and sunburn and is the major cause of skin cancer. It also contributes to tanning and skin ageing. Unlike UVA, UVB levels vary according to altitude, latitude, time of day and time of year. A broad spectrum sunscreen acts to block both UVA and UVB rays, affording better all-around protection for your skin. 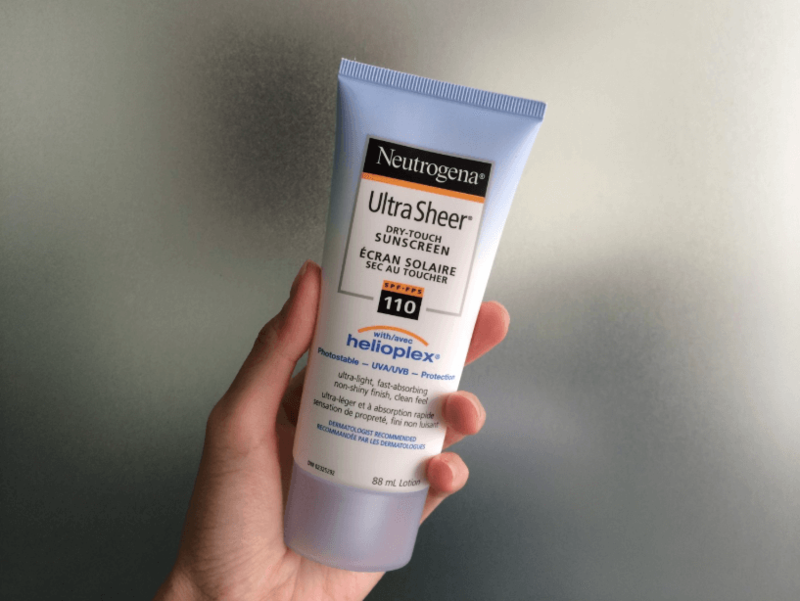 Neutrogena’s main active ingredient for combating sun damage is their patented Helioplex technology, which is a broad spectrum formulation for UVA and UVB protection using avobenzone and oxybenzone. That would make Neutrogena Ultra Sheer sunblock a chemical based sunscreen. 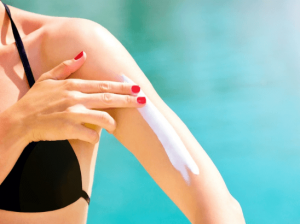 Usually, products with avobenzone and oxybenzone are referred to as sunscreens while those containing actual physical blockers titanium dioxide and zinc oxide are known as sunblocks. I’m not sure how Neutrogena is able to call certain products sun blockers when they appear to be the same as sunscreens, but that is a discussion for another time. So as not to get confusing, I’m focusing here on the sunscreens. The main challenge in providing effective protection from UVA rays is that traditional chemicals used in sunscreens that absorb UVA light degrade quickly and become ineffective. Helioplex combines two exisiting chemicals, but does so in a successful unique way. The avobenzone here is in a more stable form, so it doesn’t lose its effectiveness with exposure to sunlight like in other sunscreens, so your application lasts a little longer. Regardless of the SPF number you chose, all of Neutrogena’s dry-touch sunscreens have a light mildly floral scent that is not overpowering at all. This is a sunscreen that is meant especially for acne-prone and sensitive skin, and has never caused any breakouts on my temperamental skin. 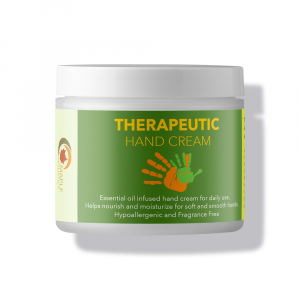 When worked in properly, this thick white cream, which is spread easily and is absorbed quickly, is non-greasy. It does not leave your skin feeling dry nor does it add a layer of oily stickiness I sometimes experience with other sunscreens. Even when I was sweating I did not experience any greasiness. The Ultra Sheer Dry-Touch Sunscreen really does have a dry finish. 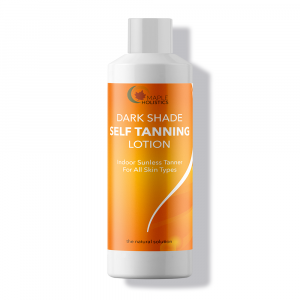 This sunscreen begins creamy but quickly dries down to a matte (in feel) finish. It does leave a very slight sheen on the skin, but it’s hardly worth complaining about, especially if you are dealing with oily to very oily skin and have been so far unable to find a stand-alone sunscreen that doesn’t feel too heavy or greasy. If you apply foundation, tinted moisturizer, powder etc’… it will work just fine. I use it as a foundation primer, because it creates a smooth, matte finish that keeps oil in check and makeup in place. Considering my past experience with sunscreens, I would say this is one of the easiest to apply as it penetrates into the skin without leaving any unsightly residue behind, and though it is not cheap, only a small amount is needed to cover the whole face and neck area, making the tube last for longer. 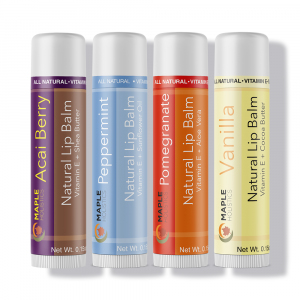 You can use another sunscreen, like Maple Holistics’ excellent SPF 30 natural sunscreen for the rest of your body. 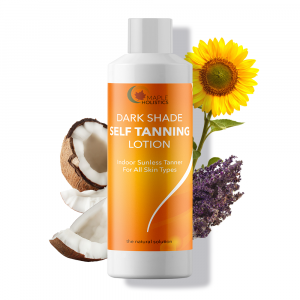 Apply liberally on face and body 15 – 30 minutes before sun exposure. Remember, you must reapply sunscreen every 2 or 3 hours (though with this Helioplex tech, 3-4 hours is fine) if you are staying / working outdoors in the sun. Also reapply right after swimming. Neutrogena’s Ultra Sheer sunscreen is very gentle and light on your facial skin, and really is waterproof and sweat proof. I can confidently say that because it remains effective on me even after an hour of running which is great. I do have a word of caution though do not use this if you are going to be wearing dark clothing or dark swimwear. Like many sunscreens that are colored and not clear, it CAN leave faint white streaks. This happened to me the first time I used this product and I was a little embarrassed, when my friends pointed out the streaks. The last thing I want to be worrying about while enjoying a beautiful sunny day are these stains. This is another reason I only use this on my face and not the rest of my body. Apply only on clean, dry skin 15 to 30 minutes before you go out in the sun to allow it time for it to interact with your skin. Reapply it just before you go out – you’ll increase the amount applied and be more likely to get the stated SPF benefit. Make sure to properly cover all parts of your body not protected by clothing (don’t forget your ears, the back of your neck, the backs of your hands and the tops of your feet). 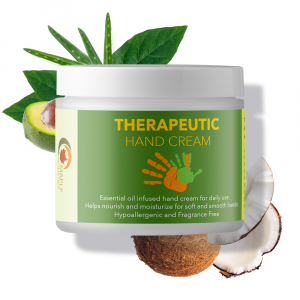 Apply it evenly, and though it needs to be rubbed in gently, make sure you don’t do so excessively – most sunscreens will absorb into the outer layer of skin and doesn’t need to be rubbed in vigorously, or you can rub it completely off. Reapply at least once every two hours (3-4 with this product) and after swimming or exercise. Sunscreen should be used throughout the year – use sunscreen whenever you go outdoors for a significant amount of time, such as to the park, a lunchtime walk to the shops, playing sports or gardening, regardless of the season. Never rely on sunscreen alone. Sunscreen is only a secondary and partial defense against UV radiation. First and foremost, you should try to avoid the sun in the middle of day as much as possible. If you do go out, wear a broad-brimmed hat or scarf, a dense-weave top and sunglasses and seek natural or man-made shade as often as you can. Sunscreens can sometimes lull people into a false sense of security, in which they will stay in the sun longer, therefore exposing themselves to more damaging UV radiation. However, that doesn’t mean that you shouldn’t use sunscreens – only that you should be aware of its limitations, and not rely on it solely for complete protection. Don’t use sunscreens that have passed their expiration date as they may have lost their effectiveness. Store your sunscreen at a temperature of less than 30° C. If you leave it in the glovebox of your car or in the sun, it may lose its effectiveness. When you’re outside, keep it in your bag, in the shade or wrapped in a towel. Those with normal to dry skin might find this sunscreen too drying, but it’s a great option for oily and/or breakout-prone skin, and it wears well under makeup. The pros in my opinion far outweigh the cons and I will certainly be using and recommending this product as a facial sunscreen for those who need one that will work with makeup, in concert with Maple Holistics’ SPF 30 for the rest of the body. By using both, and following the tips above, you can go about enjoying your fun in the sun. Have a wonderful day and stay healthy and safe! The patented Helioplex technology gives excellent broad spectrum protection that wears off less quickly. Scent is light and not overpowering. Water and sweat resistant (80min). Spreads easily and is rapidly absorbed. Gives a dry matte finish without drying out the skin. Not cheap- Though because you can use a small amount, and need fewer reapplications, the tube does last longer. Leaves a slight sheen (though this can be easily covered up with makeup). You must thoroughly gently rub it in (this isn’t hard to do), or it will leave a little noticeable residue. Even when rubbed in, it can cause white streaks on fabrics when wearing dark clothing.